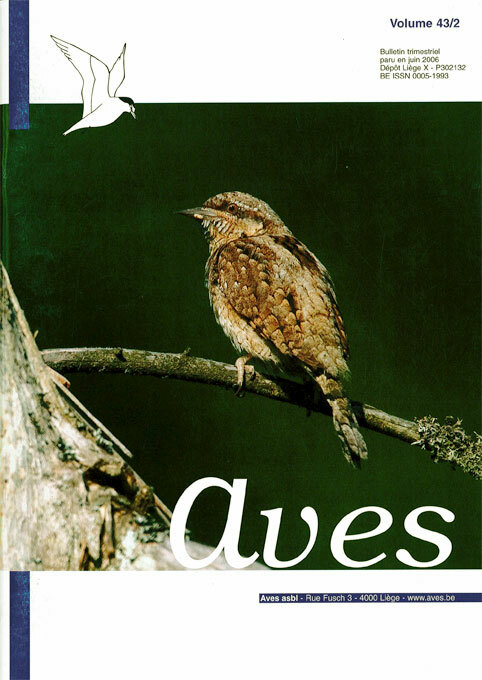 An radiotagged adult Wryneck provided information on a case of uniparental care in Wryneck in the Belgian Ardenne. The nest was located in a spruce snag of 3.8 m high abandonned after a recent spruce clearcut. The home range reached 255 ha before the nesting period. During the incubation and the feeding of youngs, it was reduced to 8 ha. Foraging took place mainly in the clearcut remains, between 150 and 500 m from the nest. Both incubation and feeding of youngs were performed by the radiotagged adult solely. Among the five eggs, only two chicks hatched. This is a putative case of male-only care. 15 years of survey of the House Martin (Delichon urbicum) in rural, urban en suburban habitat in the Greater Namur. Wind turbines and Birds : a possible cohabitation?